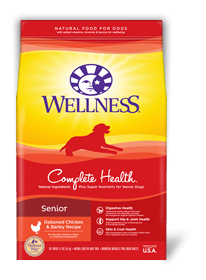 Wellness® Senior Recipe contains the reduced calories and phosphorus, increased fiber and moderate levels of protein and fat needed by aging dogs. 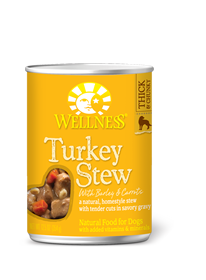 Real food ingredients include high quality chicken for a protein source, fiber for digestive health, sweet potatoes and carrots for healthy eye and hearts, whitefish for a healthy coat and a blend of fruits and vegetables for antioxidant support. Chicken Broth, Chicken, Whitefish, Chicken Liver, Ground Barley, Rice Bran, Sweet Potatoes, Carrots, Ground Flaxseed, Carrageenan, Guar Gum, Potassium Chloride, Salt, Canola Oil, Iron Proteinate, Zinc Proteinate, Choline Chloride, Vitamin E Supplement, Cobalt Proteinate, Copper Proteinate, Manganese Proteinate, Riboflavin Supplement, Sodium Selenite, Thiamine Mononitrate, Vitamin A Supplement, Vitamin B-12 Supplement, Potassium Iodide, Biotin, Vitamin D-3 Supplement. For combination feeding, reduce dry by 35g for every 170g of wet food. 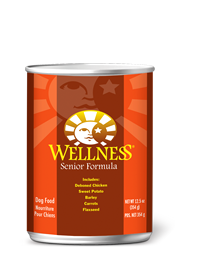 Wellness® Senior® Formula Dog Food is formulated to meet the nutritional levels established by the AAFCO Dog Food Nutrient Profile for maintenance.